Anyhow, in a rather passive manner the UK seems to have played the game with a straight bat by denying Mikhail Fridman a 'comfort letter' re: his planned acquisition of RWE's North Sea assets - something else that may not sit well with our German friends. RWE, it will be recalled (click on label), along with its fellow German mega-utilities is right up a gum-tree, courtesy of Berlin's demented energy policies - wildly, infeasibly green + anti nuke. They will all be making big asset sales in an attempt to steady the balance sheets: and RWE is in the bed nearest the door. They need the dosh, and now we've stopped it. This is the thanks Germany gets for letting the Hinkley Point nonsense go through the EC?! But on that front, there is someone else with a mighty beef: the French have let EDF's CEO go ! Just hours after his Hinkley triumph. Not green enough, they say. 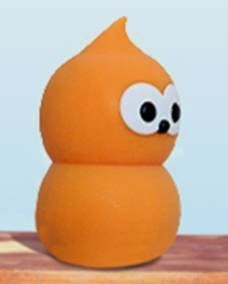 Of course he's not: FFS, he's the bright orange, glow-in-the-dark head of EDF ! Le Turd Radioactif lui-même ! Couldn't happen to a nicer chap: I laughed until I stopped. In this country he would have been given a peerage. Perhaps Cameron will. Disclaimer: yes I am long LMT since nov 13, but not due to this. That is the best caption to a photo we have ever managed on the blog - hurrah! Lockheed have few real military orders Andrew. This is a rather desperate plea for something for some money. My recollection is that this is the purpose of skunkworks? Couldn't they just chip in with some likeminded folk and buy the presidency again? Do you think EDF will end up owning all the German utilities? As in UK? Hang on. Read that link. "U.S. submarines and aircraft carriers run on nuclear power, but they have large fusion reactors on board that have to be replaced on a regular cycle." I think that should be 'fission'. Whether thorium fission or hydrogen fusion comes to the rescue, we still can't increase energy production indefinitely without finding a way to get rid of the excess heat from the earth and atmosphere. That will be on the impossible side of tricky. That's a big point in favour of sensible renewables e.g. solar in hot places. After read the article i have come to you to know the handy discussion as well. Because i will come to you to know the wonderful article. Thanks a lot mate.